The design of Mattel Children’s Hospital UCLA aims to create a compassionate healing environment that is as warm and inviting as a hospital can be. 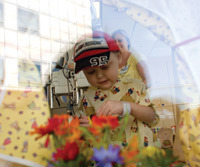 That Mattel has achieved such an atmosphere is clear from the moment families enter through the hospital’s dedicated entrance off of Gayley Avenue and are greeted by an interactive Welcome Wall, and it continues to prevail on the hospital’s third and fifth floors. “We found that we harmonized very well with I.M. Pei’s concept of human-scaled space,” says Dr. Edward R.B. McCabe, physician-in-chief of Mattel Children’s Hospital UCLA. “In pediatrics, this is particularly important because kids can be intimidated by large spaces.” A butterfly canopy marks the Mattel entrance. 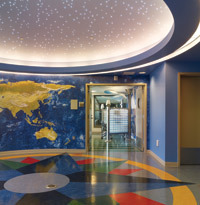 The child-friendly décor of the main lobby features the 60-foot-long, 12-foot-high multimedia Welcome Wall of photographs, children’s art and video content displayed on eight screens. The messages include stories of hope, healing and recovery from patients and their families, as well as a view port into which children can peek and then find their own image projected on the screens.